We're at another conference this week. Very close to home this time. We'll be back with a new post on Tuesday! We welcome you to review our archives by selecting topics that interest you from the list along the left side of the page. Here are some more of our favorite books to read to babies and toddlers. Both of my favorite books have spectacular illustrations. While babies will not follow the stories (they’ll be more interested when they are about 2 or 3 years old), they will love to look at the colors and pictures on the pages. Baby Honu is a sea turtle who recruits some special friends to save a beached dolphin. This is a beautiful story about how the moon gets up into the sky. The pictures are beautiful and there are very few words, a nice bedtime book to share. A classic from many years ago, this book includes a simple story on pages filled with different textures for babies to touch. I had a few of these books; my kids tended to wear them out while exploring the pages. This cute little rhyming book is another story about how much parents love their babies. Sandra Boynton books are always good choices for imaginative characters and bright colors. While this book is nearly as old as I am, it is a classic. With all the silly rhymes and pictures, babies will love to hear your voice repeating the same sounds over and over. Another fun rhyming book that your children will want to hear again and again. They’ll love the crazy results from the simple beginning of giving a mouse a cookie. The pictures and colors will keep babies’ attention until they can follow the story themselves. While it is not as well known as the other books, this story was one of my daughter’s favorites. It is a lovely rhyming story about a little boy who asks a king and queen if he can bring animal friends to his many visits to the palace. This one will be a favorite for years. Next time: We’ll Solve Some Baby Behavior Mysteries! Last time, Taryn shared the latest research about the value of reading to your baby or toddler. After talking excitedly about the special baby books we had read to our own children (or remembered from childhood), we realized that we needed more than one post to share our favorites with you! As you know, we don't promote or name products on this blog but we had to make an exception for these wonderful books (and no, we don't have any investments in bookstores or publishers). First up, JenG and Kerri share their favorite baby/toddler books. This was a fun interactive book that I read to my daughter from the time she was only a few weeks old all the way until she was about 2 years old. In the beginning she simply loved being talked to and kissed. As she got older she learned all of her body parts as we kissed them throughout the book. This is a classic! If you haven’t already added it to your library, you probably should! This book is written as a beautiful poem that starts with saying goodnight to everything in a little bunny’s room. At an early age my daughter would point to the objects we were saying goodnight to as we went through the book, later she would finish my sentences: Goodnight ____. Goodnight____. The story ends with bunny asleep in his bed. This book provides a great transition to bedtime. This story is the tale of a daddy rabbit and baby rabbit that try to outdo one another with examples of how much they love each other. It is very sweet. When I read it, I changed the wording so that it was mama rabbit. My daughter would always have this wide, confident smile after we read this book. A very sweet bedtime book that I found when my daughter was 12-18 months of age and struggling with bedtime. The rhyming was very comforting and almost lulled her to sleep. I was working during the day and so my favorite line was: “Mama is always near, even if I'm not right here." I wanted her to know that just because she couldn’t see me at times, didn’t mean I wasn’t coming back to her. The Very Hungry Caterpillar teaches about the days of the week, and the life cycle of a caterpillar. My daughter loved this book, especially the end when the caterpillar came out of the cocoon and was a beautiful butterfly. This is a fun book about a white rabbit who jumps into different colors of paint (red, yellow, and blue) to become a different color. The rabbit takes a shower to wash each color paint off, but soon runs out of water and only has a little paint left. This is a great story to teach your child about colors and how 2 different colors can be mixed together to make a third color. My daughter and I read this book every night before bed for months. This book is about “dinosaurs” that don’t want to go to bed but by the end they let the parent tuck them into bed and say goodnight. “They give a big hug, then give one kiss more. Goodnight, goodnight little dinosaur." 4. Brown Bear, Brown Bear, What Do You See? by Bill Martin Jr. This is a great rhyming book that teaches about colors and animals. My daughter’s favorite part was at the end when it lists all of the animals that the children would see! Now its your turn! What are your favorite books? Next time: More of Our Favorite Books! How important is reading to your baby? Does it really make a difference? After all babies can’t understand what you read, right? Wrong. Research shows us that the sheer number of words spoken to babies (by people, not computers, phones, or TVs) between birth and 3 years of age improves babies' brain function, vocabularies, as well as their abilities to speak and relate to others. This advantage begins early and extends into preschool, grade school and beyond. Reading to your baby is an easy and fun way to create some wonderful memories while increasing the number of words your baby hears. Babies are born to learn. When babies are introduced to books, they gain a broader exposure to words they wouldn’t hear during typical day-to-day activities. For example, a baby may hear the words “dad, diaper, table, door, and potato” on a regular basis, but words like “zebra, princess, Saturn or cactus” are not part of daily conversations. Additionally, books can help children learn about human emotions, numbers, colors, and word-picture associations. Researchers are still unsure about the best age to start reading to children but we do know that children who are read to as babies have higher scores on oral language, reading comprehension, and general intelligence tests than children who were not read to as infants. Reading to your baby creates a warm positive atmosphere around books so that your baby will enjoy exploring books later in life. 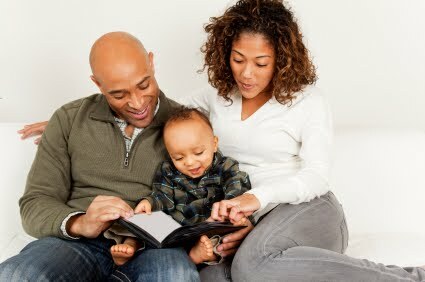 Reading may also provide special one-on-one bonding time with your baby as he snuggles in your lap, pointing to the pictures or words on the page. Reading can also create opportunities to bring the whole family together. 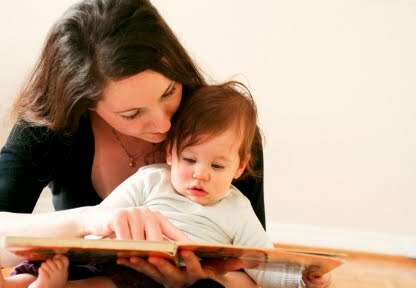 Your baby will love to hear your voice as you read more complex stories to your older children. Just be ready with a distracting toy in case your baby loses interest too quickly. How Do Babies Experience Reading? Though they aren’t actually reading the words, babies are observing you as you turn the pages, point to pictures, and make facial expressions to show emotions. Reading is an interactive experience. Reading will help you develop a comforting routine, especially at bedtime. Babies will enjoy reading the same book many times. Though The Very Hungry Caterpillar or another baby-classic may not be intellectually stimulating for you, your baby will enjoy the familiarity of the words and pictures and love being able to predict what will happen next. Sturdiness – babies like to explore with their mouths. Enough said. Colors – bright, contrasting colors and patterns are best for babies. Length – pick short books with few words, an infant’s ability to focus is relatively short. Texture – as babies get older, they will enjoy flipping and opening doors and labels on books. Having scratchy, fuzzy and smooth surfaces is interesting and engaging. We hope these tips will help inspire you to get your baby off to the right start by exposing him to the joys of reading. Next time: Our Favorite Baby and Toddler Books! 1. Jack, Kate. ‘Why Babies Need Books’ http://www2.scholastic.com/browse/article.jsp?id=1513. Accessed Jan.13, 2011. 2. Debaryshe, B. (1993). Joint picture-book reading correlates of early oral language skill. Journal of Child Language, 20, pp 455-461. 3. Karrass, J. (2004). Effects of shared parent-infant book reading on early language acquisition. Applied Devel Psych, 26, pp 133-148. 4. Tomasello, M. (1992), The social bases of language acquisition. Social Development, 1: 67–87. Welcome back! Today’s post is part 2 in a series focused on using your baby’s developmental stages to help baby-proof his environment. Now let’s take a look at the older baby, age 6-12 months. Note: If your baby is just now moving into his crib, review part 1 of this blog for links to check crib safety. Remove any hanging toys from the crib when you notice your baby can reach up and touch them. Put outlet covers on all outlets; even those hidden behind furniture. Little arms and fingers can find their way into the smallest of holes. Lock cabinets; especially those that contain any poison or chemical that could be ingested. If unable to lock cabinets, remove all poisons and chemical cleansers to a safer location; like the garage. This includes medications, alcohol and even vitamins. Clear all objects off coffee tables, or other low furniture. Even magazines and newspapers can be a hazard. Babies will be able to tear pages and it will almost always end up in their mouths. This can be a choking hazard. A good rule to follow: if an object can fit through a toilet paper roll, it is a choking hazard and can get stuck in your baby’s throat. These items should be placed in a locked drawer or up out of the reach of your child. 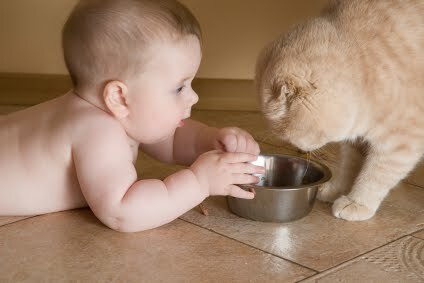 Keep pet food (if any) out of the reach of the baby. This might sound like a silly tip, but I can attest from experience that your baby will be drawn to your dog’s bowl of puppy chow. It’s amazing how quickly they can move towards the food and pop a few pieces in their mouths! Many babies this age are beginning to pull up on furniture (or people) to get themselves from a sitting to a standing position. With this new ability comes a brand new perspective of his world! Soon he will be walking along furniture and exploring everything that is in his new line of vision. Baby proofing must now be taken to the next level. As soon as your baby can get up on all fours he could use the crib bumper pad as a step to climb out. Remove it from the crib. Coffee tables and other furniture that babies could pull themselves up on should be cleaned off completely. 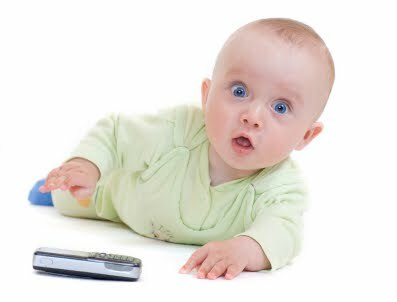 Babies can pull heavy objects over on themselves easily or put things they find lying about into their mouths. Double check outlets and cords. Remember, pulling up brings baby to a new height! Watch sharp corners on furniture or any sharp object that is just the right height for head bumping. There are soft, non-permanent corner covers available for corners of tables. Or move the offending piece of furniture elsewhere for a while. Most babies are learning to take steps and some are walking pretty well by this time. Again, more mobility leads to more exploring! Babies become little scientists, exploring and testing the world around them. When it comes to walking and movement, 12-month-olds often have a one track mind. It is common for babies this age to focus all of their energy on perfecting their newfound skill, leaving little time for eating, sleeping, or getting their diapers changed. Make sure breakables are completely out of reach. Remember babies are stronger and more mobile now! Do not leave sharp objects such as scissors, clippers, pens and pencils within your baby’s reach. For more information about keeping your environment safe for your child visit: www.safekids.org. For information on crib safety click here. For information on recalled baby items click here. Next time: Reasons for Reading to Your Baby! Why would a healthy newborn fuss 5 to 15 minutes after nearly every feeding? Why do some toddlers give their parents the "cold shoulder" when they first see them after a long separation? Why do some babies cry for a long stretch every day at the same time (often in the late afternoon or early evening)? Why would older babies suddenly seem afraid of members of their own families? 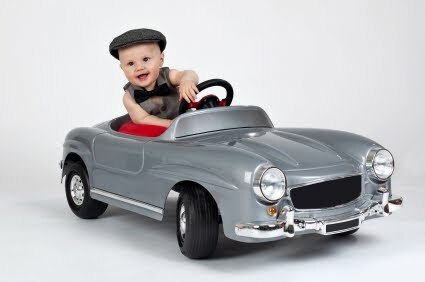 As we start a new year, we thought we'd ask you a question - what are your baby behavior mysteries? Is there any behavior you've seen in your baby that seems strange or confusing? Post a comment and let us know. We'll share the "solutions" periodically in future posts! As all of our readers know, waking up at night is important for young infants’ health and well-being. We understand how frustrating waking up can be. We know how it feels to literally ache for some sleep. But think of it this way, giving birth to a baby large enough to go 8 hours between feeds would be a lot more painful! So, for a least a few months, you’re going to be getting most of your sleep in relatively short stretches with lots of interruptions. We found a few recent studies that provide some ideas for some small changes in your routine and environment that might help you get just a little more sleep. While none of these tips will lead to your baby sleeping through the night, when you’re waking up so frequently, every little bit helps. Stimulate your baby during the day to encourage more sleep at night. After the first month or so (when babies' rhythms are completely chaotic), you’ll find that your baby is able to stay awake for longer periods of time. Try adding more playtime during the day to keep your baby awake so that she starts to concentrate longer stretches of sleep to nighttime hours. The American Academy of Pediatrics recommends that your baby sleeps in the same room with you for the first year of life. Having your baby close by will keep night interruptions shorter, letting you get back to sleep more quickly when every minute counts. Newborns can make a great deal of noise when they are dreaming. Having some low-level white noise will help you adapt to the fidgeting, squirming, and soft squeals so common in young infants. This way, you can sleep close by and wake readily when your baby really lets you know she needs you. Use night lights (or low lighting) in all the areas you use to care for your baby. Keeping lights low while you feed, burb, or change your baby’s diaper will help you get back to sleep more quickly when your baby is settled again. Bright lights will signal your brain to wake up and stay awake. Of course, you do NOT want low lighting if you are doing something that requires your full attention such as giving medication to your baby. Also, unless you want your baby to stay awake, leave the TV off. Flickering lights and noises will send signals to your baby's brain that its time to wake up. In a very small but interesting study, babies who were given a massage at bed time for 14 days (starting around 2 weeks of age) were more likely (at 8 and 12 weeks of age) than babies who didn't get a massage to have their most active time in the morning rather than during the night. The researchers suggest that the daily massage sent a strong signal to the babies' brains to help them get better in tune with their parents' day and night rhythms. Skuladottir A, Thome M, Ramel A. Improving day and night sleep problems in infants by changing day time sleep rhythm: a single group before and after study. Int J Nurs Stud. 2005;42: 843-50. Lee KA, Gay CL. Can modifications to the bedroom environment improve the sleep of new parents? Two randomized controlled trials. Res Nur Health 2010; Epub Nov. 17. Ferber SG, Laudon M, et al. Massage therapy by mothers enhances the adjustment of circadian rhythms to the nocturnal period in full-term infants. Dev Beh Ped 2002; 23: 410-415.